Discover nature at its finest just half an hour from Benidorm. Famous for its beautiful beaches, Benidorm has many other attractions that make it the ideal destination for nature lovers and those who love outdoor activities. Home of the tallest skyscrapers in Europe, Benidorm is sheltered by an amphitheatre of mountains, whose natural majesty form the scenic back drop to the coastline and protect it from the cold and wind. Less than a half hour drive from the city, are various hiking routes worthy of a visit, with hidden treasures for nature lovers eager for a little outdoor adventure. Walking through the pines and oaks, along paths scented with lavender, rosemary and thyme becomes an experience which awakens the senses and purifies body and soul. Easy to identify, the Puig Campana is the second highest peak in the Alicante province. Located in Finestrat, just 10 kilometres from the coast it rises to 1,408 meters and has given rise to many legends because of its unique form. The missing piece at its peak awakens the curiosity of all and according to the legends was tossed into the sea creating what we know as Benidorm Island. Its legendary groove attracts many to climb to its peak and contemplate the spectacular views of the enigmatic Island out at sea. There are three routes you can take: “Volta de la Serra” is the most common route to the peak, the second route “Ascension Puig Campana is a bit more complex and the third route is the “Cami de la Cove del Roget”. The routes are classed as low to medium difficulty so they are apt for all hikers and the duration of the routes vary between 4 to 6 hours depending on the route chosen. All routes start from the Font del Moli. If you want to enjoy a country walk by the sea without leaving Benidorm, then visit the Sierra Helada Nature Park. 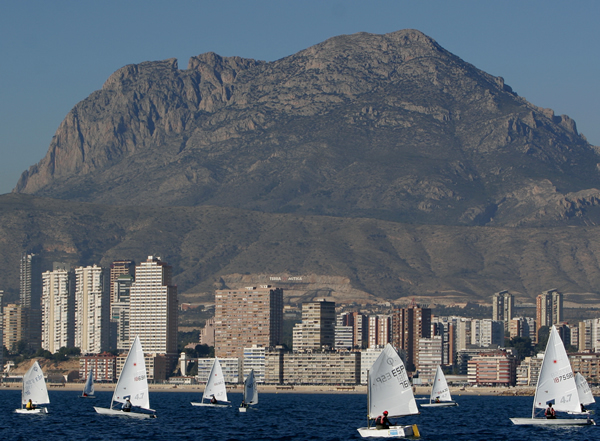 With spectacular 300 meter vertical cliffs, the park covers three towns, Benidorm, L’ Alfas del Pi and Altea. There are different routes, but the most interesting runs along the edge of the cliffs from Benidorm to Albir. Starting at the cross, the route continues on until the entrance to the Light House in Albir, the route is hilly which breaks the monotony of the long ascending route. This 9 kilometre, 4 hour hike offers spectacular views as well as fossil dunes and unusual vegetation. If you prefer a leisurely stroll with your family, your best bet is to take the popular route to the Lighthouse in Albir. This route does not require great physical effort and is easily accessible. It takes approximately one hour in total to complete the round trip of the approximately 3 kilometres route. The path takes you past charming coves and the old ochre mine and from the viewpoints you can clearly identify the Bay of Altea and the imposing Peñon de Ifach of Calpe. 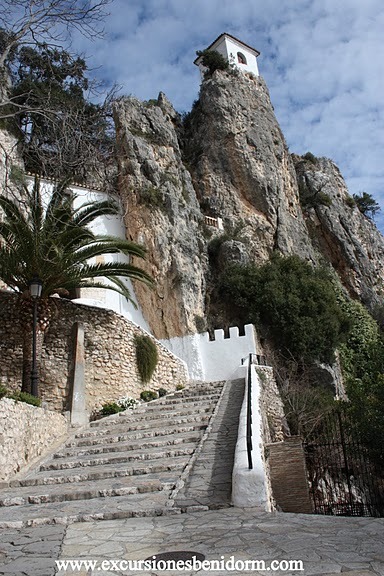 In Altea there is another exciting alternative for your outdoor adventure, the Sierra Bernia Mountain. Its sharp peak extends perpendicularly from the coast, inland, acting as natural border between the Marina Baixa and Marina Alta areas. A spectacular rock formation, 11 kilometres from East to West, it covers 1,900 hectares and the towns of Altea, Calpe, Callosa d'Ensarria, Benissa and Jalon (Xaló). Its highest point is 1,128 meters above sea level and from the peak you can see the entire coastline from the Cape La Nao in Javea to the port of Alicante. On a clear day you can see the island of Ibiza. On the Southern slope of the Sierra Bernia you will find Fort Bernia, which served firstly to prevent the riots of the Moors and secondly to defend the coastline from the frequent pirate attacks. The construction of this fort was ordered by Felipe II in 1562. In this historic fort, located 800 meters up the mountain, you can still see some architectural remains of walls, domed buildings, moats and towers from the fort. Nature’s incredible beauty and creativity surprises us once again with unique geological formations such as the “Forat Bernia”, a hole carved through the mountain approximately 1,000 metres up. The sensations you experience as you pass through this natural tunnel are incredible. In certain areas you have to squat to get through until the cavity widens, the sunlight streams in and the immensity of the sea unfolds before your eyes. Another option is the Ponoig, known locally as the Sleeping Lion because of its shape. It stands majestically in Polop de la Marina, guarding the area only 20 minutes from Benidorm. This impressive vertical mountain reaches 1,181 metres and attracts climbers to the area every year willing to climb its walls and conquer the summit. The walls of the Ponoig rise 600 meters in height and the reddish colour of the rock have given rise to its nickname the Spanish Dolomites. Both traditional climbing and sports climbing are practised on the Ponoig and there is a Via Ferrata, a route equipped with fixed cables, stemples, ladder and bridges, for those who want to conquer the heights. However, the Ponoig also offers the possibility of less risky walks along its paths. The Xirles Ravine (Chirles Ravine) the climb to Ponoig via Margoch, the Collado del Llam, el Salat & L’Almassera are just some of the most common routes, each with a degree of difficulty, which range from one and a half hours up to four hours if you want to take in the views that the sleeping lion offers from its peak. If you want to ascend to the highest peak in the Alicante Province, then this is your challenge. The Sierra Aitana mountain range, to which the Puig Campana and the Ponoig form a part, rises to 1,558 metres in height. One of its major geological formations can be found just before reaching the peak, the Rabosa Pass. A crack in the huge mass of stone just big enough for one person to pass from one side to the other. At the foot of the mountain as if to reward your efforts is an area known as the Fountain of Partegat with picnic and barbeque areas perfect for a day out in the country. 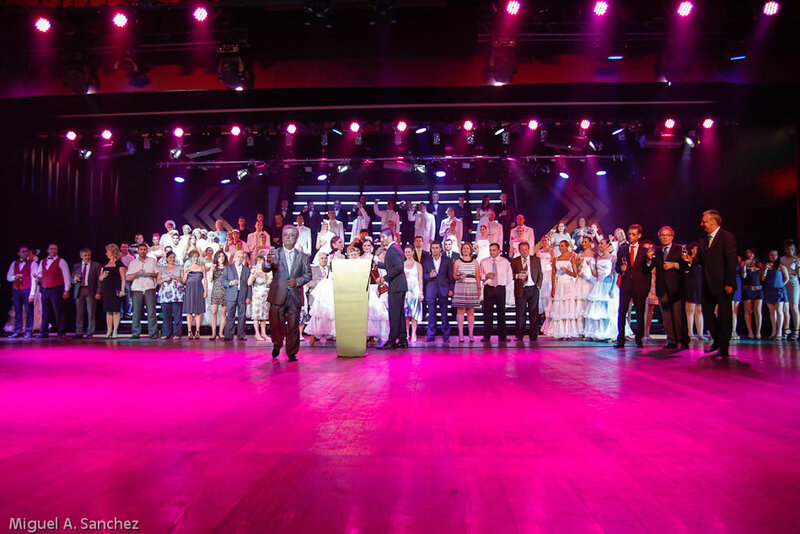 On Friday night 8th of June, the Benidorm Palace received the award for Best European Nightclub from CEPET, (the Spanish Federation of Economy and Tourism, Writers, Journalists and Publishers). The award acknowledges the Benidorm Palace’s contribution to tourism in Benidorm and the Costa Blanca and to its dedication and hard work over the last 35years. Important dignitaries from Benidorm, Alicante, Valencia and other local towns attended the dinner, presentation and award ceremony. Alberto Fabra, President of the Valencian Community and Lola Johnson, Councillor for Tourism in Valencia also congratulated Vicente during their visit to INVATTUR (Valencian Institute of Tourist Technology). Vicente Climent Llorca, President of the Palace Group received the award on behalf of his team and graciously accepted the accolades and recognition of achievement. The Benidorm Palace was recognized for its part in promoting Benidorm as a tourist destination and resort and for the important contribution to leisure and cultural entertainment in Benidorm. The President of CEPET, Domènec Biosca, presented the award, accompanied by the Director of Tourism for the Costa Blanca, Sebastian Fernandez, and Agustin Navarro, the Mayor of Benidorm. “This is the first time that the Federation has awarded this accolade to a leisure or entertainment venue” stated Domènec Biosca. “ Leisure activities are an important part of tourism and the Benidorm Palace has two prestigious venues the Night Club and the Circus both of which also promote the city of Benidorm with their product name”. Thanking all those present and with his wife, family and the Benidorm Palace team on stage, Vicente expressed his gratitude and thanks for the award. The Benidorm Palace took the opportunity to officially present its new show SURREAL to the attending public and dignitaries. Inspired by the Spanish Masters of Surrealism, such as Buñuel and Dali the show opens for the summer season and will run until next summer. 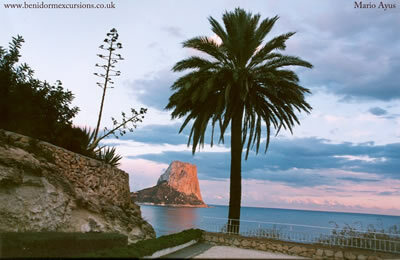 It is impossible to talk about Calpe, without mentioning its famous rock, the Peñon de Ifach. Created by one of nature’s quirks; it forms one of the most unique and beautiful geographical features of Valencia and of the entire Mediterranean coast. Nature formed this magnificent area where the marine life and fauna all reside in a truly exceptional climate. The only similar paragon with the Peñon is the Rock of Gibraltar. The Peñon has two distinguishable parts: the upper surface with vertical limestone walls and the lower part with a different composition, containing more clay, gentle uphill slopes and recent formations. The newer portion of the Peñon is lower than the upper portions and did not originate in situ, but because of a huge detachment or landslide from the nearby Sierra de Olta Mountain. Despite being in a highly populated area, the rock retains much of its biological value and plant life. Many of the plants that grow there have caught the attention of botanical experts worldwide as do the different type of birds that nest in its crevices or stop over to rest during migration. The Eleonora Falcon (Falco eleonorae), the Peregrine Falcon, the European Shag a species of cormorant , the Alcatraz, a type of pelican, the northern gannet, the pallid swift, the yellow-legged gull, the common kestrel and the European Greenfinch as well as lots of reptiles and lizards. 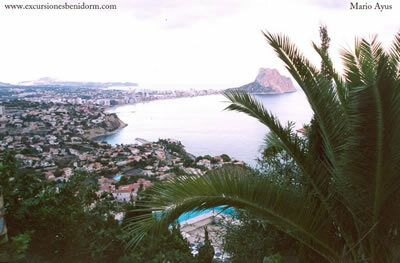 The Peñon belonged to the town of Calpe until the late nineteenth century, when it passed into the hands of various private owners until being acquired by the Generalitat Valenciana, shortly before being declared a Nature park. As one of the smaller European nature parks, only covering 47 hectares, this promontory is unique due to its bioclimatic features, the nature of its soil along with the variety of flora and vegetation. Boat trips from Benidorm along the coast to Calpe - tickets here. Guadalest, a small town full of narrow streets and corners rises from the heart of the Marina Baixa. It is the ideal place to find peace in the surrounding landscape and culture. Located in a valley full of leafy trees and mountains only 22 kilometres from the coast, the area is famous for the production of Mistela and for the cultivation of the Loquat or Nispero. Hand made items are another attraction of the area, especially lace and fabrics. With a population of approximately 200 inhabitants Guadalest is full of tradition and there are years of history in its tiny streets. At the foot of the village there is a reservoir which is surrounded by the Sierra Aitana Mountains and from where you can take a trip on a Solar Powered boat. At this time of year it is even more beautiful, between January and March, Mother Nature puts on a spectacular show with the almond blossom colouring the mountains in shades of ivory, white and pink. A delight for the senses, it announces the arrival of spring and the heady scent of the blossom fills the air. There are plenty of reasons for you to pay a visit to Guadalest and the mountainous areas that separates Benidorm from Alcoy. It is a paradise full of tradition with great cuisine using only the best ingredients all grown in the area. Enough to please the most demanding of palates. 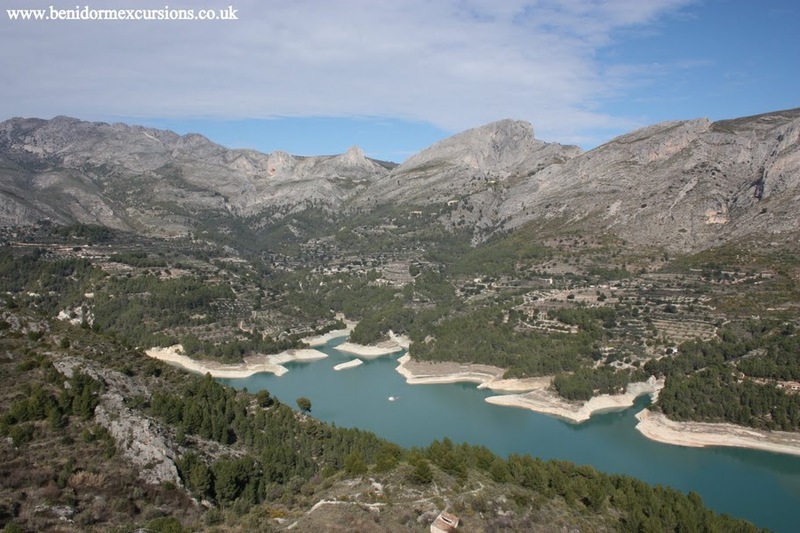 Guadalest is not to be missed! The Spanish have a proverb which states “renovarse o morir” which basically means that to survive you must keep up to date with the times. This is important in any stage of life and is also relevant in tourism. In times of crisis it is important to innovate and change. Costa Blanca Tours is a company dedicated to tourism in and around the Marina Baixa, they offer the service of official guides as well as tours in the area. In the last couple of years they have introduced new ideas to add that “little extra” to their products and services. Segway is one of those new ideas. 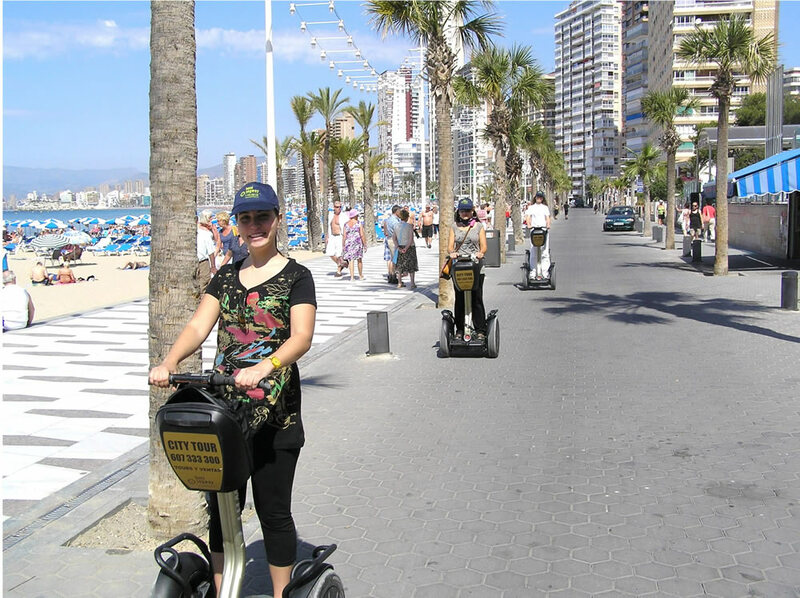 An ecological, modern form of transport, Costa Blanca Tours use them for tours in and around the area. The Company started this activity as an alternative to the traditional guided tours. This innovative excursion also includes the use of wireless radio, with the guides giving a commentary on the history of the area, scenery etc while driving on the tour. 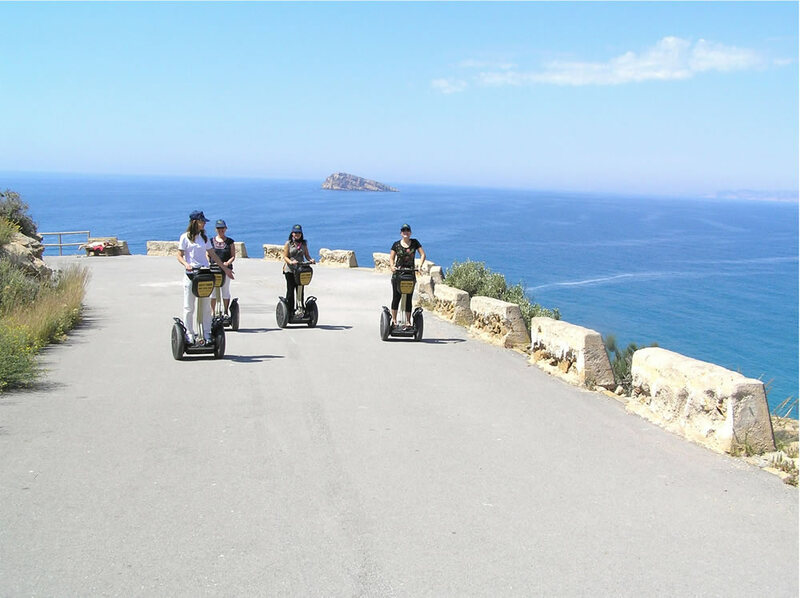 The trips are organized daily, with a short familiarization period of approximately 10 minutes before each excursion to get the “feel” of the Segway. The Segway is surprisingly easy to drive even though there are only two wheels, due to the dynamic gyroscope stabilization technology. This means that it moves with your body, there is no accelerator, no brakes and no clutch. When you lean forward slightly the Segway moves forward and if you lean backwards the Segway gradually stops. The Segway is controlled by remote control which regulates its actions for example its speed. The speed is set with the remote control to 10 kilometres per hour and only in certain circumstances and always in safe environments and terrains is this velocity increased. Anyone that loves the outdoors and adventure will enjoy this new excursion which has been enjoyed by tourists of all ages and has a high number of clients that repeat the experience. Anyone can try it; the only requirement is that your body weight is more that 40 kilos and less than 120 kilos. If you are interested in trying this new excursion the price is 29 € per person for a two hour trip. It feels like you are floating, you won’t ever want to walk any where again!